How big is this part and how much does it weigh? The dimensions of this part are as follows: 19 x 11 x 8. The weight of the part is 2 lbs according to our systems. Do you know what shipping service you will use to send me this part? Oddly. The item seems to leave the store via USPS priority. Usually, that is due to proximity to our store but this has left our store via USPS priority in about 92% of the cases we have sent it out. If we do end up shipping you this part via FedEx then your "ship to" address is what determines which FedEx service delivers your part. If you use a residential address then your part will arrive FedEx home delivery if you use a business address then you will receive your part via FedEx ground. Can I upgrade to another shipping type or have it shipped it a different way? Yes. However, any additional costs will be paid by the buyer. Therefore, you may want to consider how badly and quickly you need your part to arrive before you pay the extra shipping. Is the box sturdy enough to handle the journey to my home? We have sent this part multiple times and we have not had any complaints as of yet. The box seems to make it just fine to our client's homes or businesses. The picture seems to show two parts plus some hardware. I want to make sure that is actually what I am getting in the box. Is that what I am getting or is it something else? You will be getting those two parts and the hardware as pictured. What trims and body styles does this part fit? I want to make sure that I can use this part before I buy it. 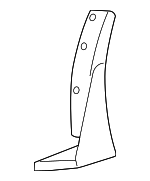 You can click here to see a detailed list of body styles and trims this part fits. If you use are visiting via a mobile browser then you might have to scroll up to see the list. The system tends to drop people who visiting from mobile browsers too far down the page. I don't have time for the big list. Could you tell me which cars this part fits, generally? Yes. 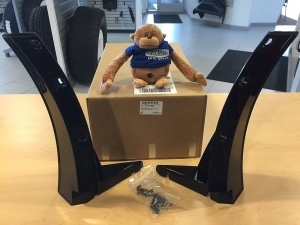 It fits the 2015-2017 Chevrolet Corvette Stingray, Grand Sport, and Z06. See the list for detailed information on the mix of years and styles it fits. The thing about spoilers is that they make the car or vehicle look cooler. The other thing about spoilers is that most people have no idea what they do or they have a very vague idea of what they do. If you ask them what a front spoiler splitter does then they will probably be at a loss for words. However, 23184895 is an item that is a front spoiler splitter but we can tell you what it does for your car other than making it look a bit cooler than other cars of the same type. The short answer is that it helps the airflow in front of the car get directed in a way that supports maximum speed and traction.